​Cellist Aare Tammesalu acts as a soloist and chamber musician, performing classical and contemporary music. Besides, he is an active music producer and pedagogue. 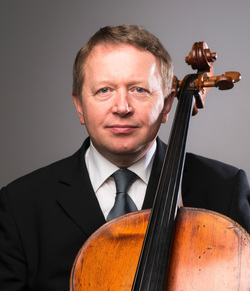 In 1985, Tammesalu graduated as a cellist from the Tallinn State Conservatory. Later he acquired a Master’s degree at the Estonian Academy of Music. He has enriched his university experiences by taking private lessons from Mikhail Homitser in Moscow and participating in the master courses of Martin Ostertag. In 1987, Aare Tammesalu won a prize at the Contest of Estonian String Instrument Players. As a soloist and chamber musician he has performed with several Estonian symphony orchestras and in numerous European countries, Canada, Israel, Iran, Russia and the USA, as well as participated in various Estonian music festivals. He is a member of the Tobias String Quartet and Resonabilis Ensemble. Aare Tammesalu has been the first performer and introducer of the works by Giovanni Bonato, Eino Tamberg, Lepo Sumera, Andres Uibo, Andrus Kallastu and others. He has released a CD with Estonian cello music (2010 ERES).